Ionized Air gun is a hand-held ionizing air gun for neutralization static charge and removing dust contamination of industrial applications. Air gun separates air molecules into positive and negative ions by means of electric field, then generates and transports them. Due to high-technologically design it is possible to produce more efficient results for static electric troubles even in high=speed applications. It provides high performance and efficient ionization with fast discharging time. Anti-static air gun separates the air molecules to positive and negative ions. Due to principle of work of anti-static air gun the neutralization of material became possible. It attracts in effective range the opposite charged ions of any statically charged product. In addition, such electrical dangers as current striking, explosion, fire and dust attraction will be also prevented. Anti-static air gun does not need any calibration and because of being simple in care enhances the quality, safety, hygiene of machine and provides its longer life. Anti-static bar is connected to high voltage resistively. Thereby its emitter pins even if they are touched will not affect by electrical shock. 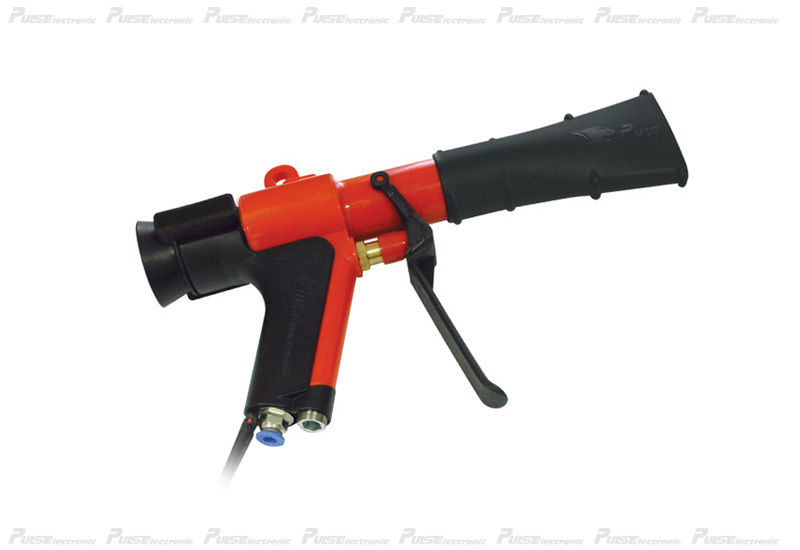 Air passing trough anti-static air gun must be clean and dry. Due to being ergonomic and lightweight anti-static air gun supplies soft and effective work. : Main Voltage 7.5 k VAC. : 100 Psi / 6 bar- Air Connector 8mm.